A jumper only good for a goalpost? 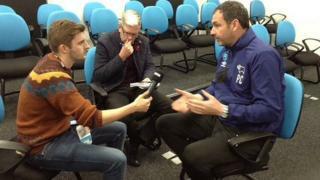 Derby County head coach Paul Clement gives BBC Radio Derby's Owen Bradley some good-natured grief about his choice of knitwear. Clement, whose side are four points off the top of the Championship table, could not help but criticise the reporter's jumper at the start of their weekly interview on Thursday. "Wow, that's a beauty," Clement said as Bradley lined up his first question.